A couple of times a year, I find myself getting roped into singing in the church choir. Now don’t get me wrong; it’s not that I don’t enjoy belting out the odd tenor line from time to time. I can even cope – just – with the early Sunday morning practices. It’s just that, even with the bribery of fresh coffee involved, I never know exactly why I’m there, and how to conduct myself appropriately – i.e., in a manner worthy of a church chorister – when I am there. So it was no small thing when I discovered one Sunday morning, sticking out from among old songbooks shoved behind the largely-abandoned organ, that our church’s choir actually has some time-honoured ‘rules’ and ‘hints’. 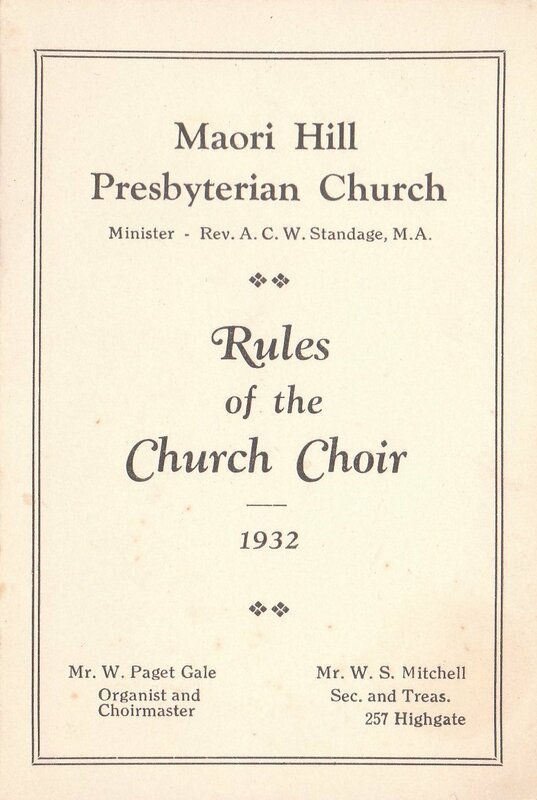 It would seem that these ‘rules’ and ‘hints’ have been lovingly authored by a certain Mr W. Paget Gale (the one-time organist and choirmaster) and Mr W. S. Mitchell (the one-time secretary and treasurer of the choir), and that under the holy guidance of the Rev A. C. W. Standage, M. A. To be sure, the august rabble with whom I am periodically gathered to sing carols, hymns and spiritual songs seem, at least in light of these ‘rules’, to be the most antinomian of Presbyterians. But, to be fair, they probably haven’t ever had presented to them Mr Gale’s and Mr Mitchell’s riot act ‘Rules of the Church Choir’. I’ll consider it my mission to make these wise and life-giving practices of grace clear to our current choir mistress; one who is, by every measure, extremely talented, but who is herself clearly a little sloppy when it comes to doing choir ‘decently and in order’ – not that she has an easy crew to work with! I’ve always thought of you as a bass baritone. And I’ve just had to look up ‘antinomian’. At least my Concise Oxford English Dictionary has had its dusting for today. 2. Sing them exactly as they are printed here, without altering or mending them at all; and if you have learned to sing them otherwise, unlearn it as soon as you can. 3. Sing all. See that you join with the congregation as frequently as you can. Let not a single degree of weakness or weariness hinder you. If it is a cross to you, take it up, and you will find it a blessing. 4. Sing lustily and with good courage. Beware of singing as if you were half dead, or half asleep; but lift up your voice with strength. Be no more afraid of your voice now, nor more ashamed of its being heard, then when you sung the songs of Satan. 5. Sing modestly. Do not bawl, so as to be heard above or distinct from the rest of the congregation, that you may not destroy the harmony; but strive to unite your voices together, so as to make one clear melodious sound. 6. Sing in time. Whatever time is sung be sure to keep with it. Do not run before nor stay behind it; but attend close to the leading voices, and move therewith as exactly as you can; and take care not to sing too slow. This drawling way naturally steals on all who are lazy; and it is high time to drive it out from us, and sing all our tunes just as quick as we did at first. 7. Above all sing spiritually. Have an eye to God in every word you sing. Aim at pleasing him more than yourself, or any other creature. In order to do this attend strictly to the sense of what you sing, and see that your heart is not carried away with the sound, but offered to God continually; so shall your singing be such as the Lord will approve here, and reward you when he cometh in the clouds of heaven. @Peter: absolutely, although the theological outlook that sponsors language of ‘unpardonable sin’ in this context raises questions about whether it’s a particularly attractive community organisation; but that, I admit, is a different matter. 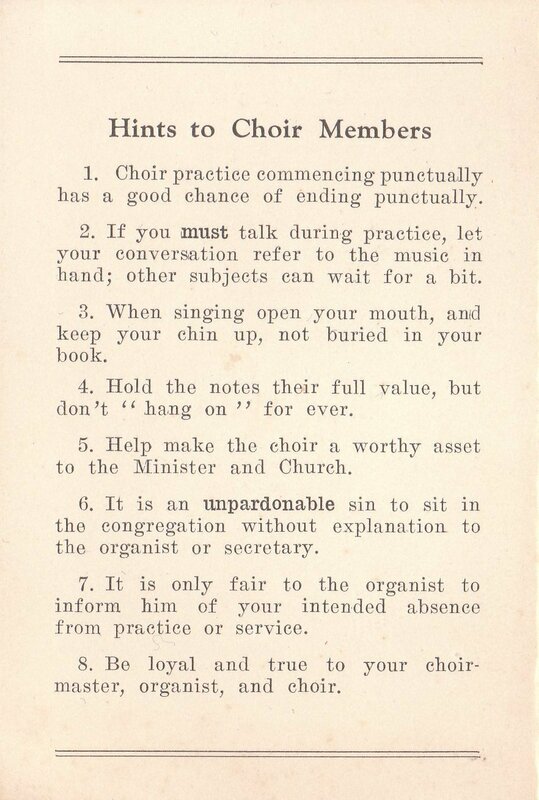 It has been beneficial to reread “Rules of the Church Choir”. 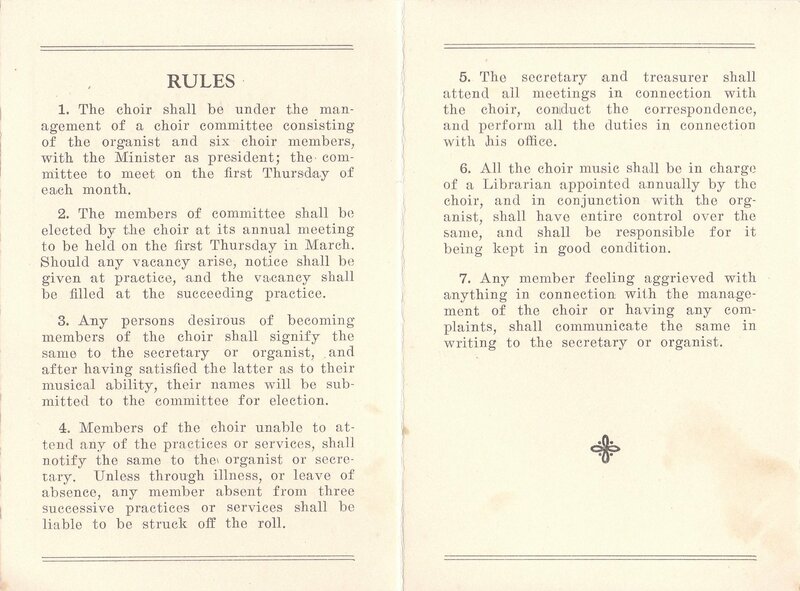 I note that in the first three Rules, the word “committee” appears four times. Shudder. However, as compensation, I am now reacquainted as to how to be “struck off the roll”.